Hi friends! Today I'm playing with some yummy May Arts ribbon. Thanks, May Arts!!! A few of us on the Little Yellow Bicycle design team are doing a blog hop to show you all sorts of fun ideas and uses for ribbon. Details on the hop are below but first, let me show you these two projects I made..
Pin this to Pinterst using the Pinit button here or at the end of this blog post. Creative How-to: Cut pattern paper the same size as the wrong of card. Measure 5 rows for the ribbon so that the largest is at the bottom and the smallest is at the top. Leave room at the top and bottom for the star and sentiment. Punch holes at the end of the measure lines and string the ribbon through the holes. Secure the ribbon edges to the back of the card with tape. 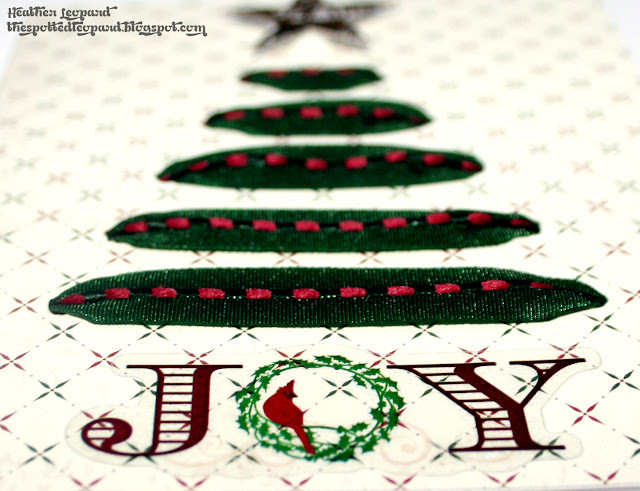 Adhere the paper with the ribbon tree to the front of the card. Complete the card by adding the sentiment and a star. 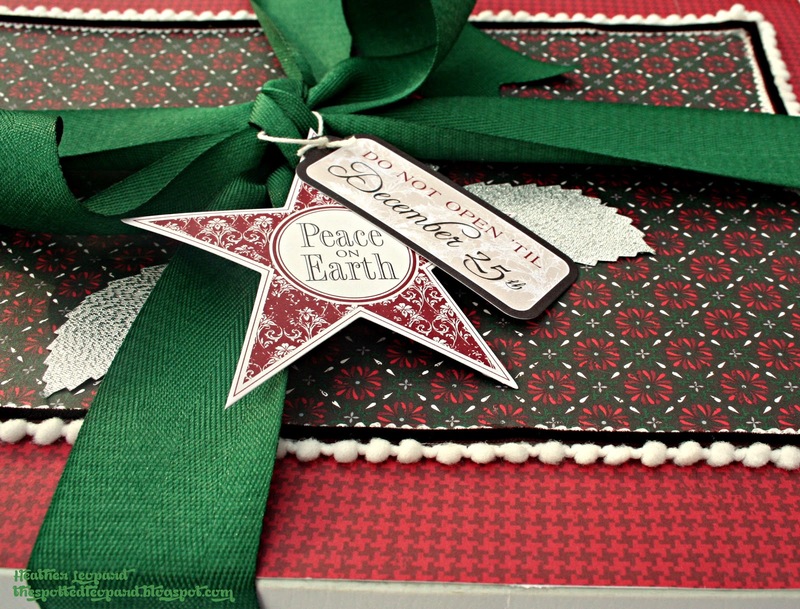 Supplies: Little Yellow Bicycle Once Upon a Christmas collection: OC-106 Snowflake Medallion/Red Houndstooth, OC-102 Poinsettia Quilt/Multi Starlight, OC-132 Tags & String, May Arts ribbon. How to: Trim inside pattern paper so that there is a 1 - 1 1/2" space of the box showing around each edge. Set aside. Trim paper strips to 2x12 and then adhere them to the box so that they cover the outer edges of the box. Adhere the pre-cut inner pattern paper over the paper edges exactly in the center. Add pom-pom trim around the edge of the inside paper to cover the seam. Add smaller velvet trip over the pom poms. Tie the green ribbon around the package, adding the tag and silver leaves immediately before tying. Your shirt box goes from drab to fab! Alright, now it's blog hop time. Make sure to hop along to each of us - follow our blogs if you like what you see, Pin images to Pinterest to spread the word, leave comments, whatever you're in the mood for today - and then stop by the Little Yellow Bicycle blog and May Arts blog! 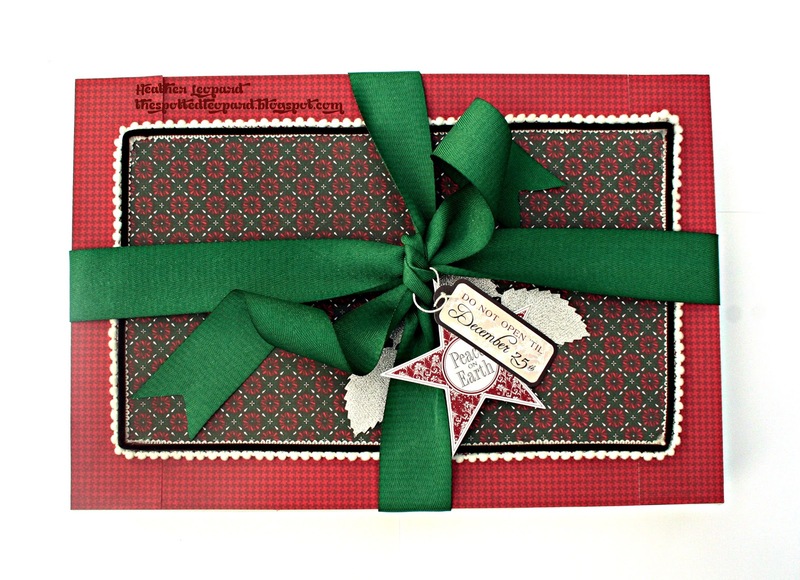 LYB is giving away an awesome Once Upon a Christmas collection! Yay!!! Very cute card ! Love the idea of a ribbon tree. Great projects and your instructions are clear and easy to follow ... will definitely be giving the ribbon tree technique a try! Thanks for sharing! Great projects. I really love that Joy card! Now I need to try that. Great ideas and love the ribbons! So rich and gorgeous, love the card. How cleaver and creative. Love what you did with the ribbon. I've got to try this. Very creative!! You girls really rocked the ribbon this week!! LOVE both projects!! Just beautiful!! These are great! I especially love the tree card - what a cool idea. I love how graphic and modern it is. LOVE that ribbon Christmas tree! Love the idea of using ribbon that way for a tree. The gift box is beautiful! OMG, great stuff! Love what you did with the ribbon! Clever use of the ribbon to make the tree shape. Very fancy gift box and love the ribbon tree. I really like both of your projects, very creative! LOVE that tree!! Thanks for sharing. Great ribbon tree card and gift box! That cute tree is a fabulous idea.... gotta make one! May Arts has fabulous ribbons, and love the pretty LYB papers too! Yummy! I love your card and the cleaver Box! I'm liking the pom pom ribbon. Wow, what a beautiful card!!! Thanks for the inspiration!!! Love the ribbon tree! Great idea! I never would have thought of using ribbon to make a tree. The ribbon tree is fabulous! thanks! Very pretty and unique - I love the Joy stamp with the tiny bird!! WHAT a great idea using the ribbon like that. Very clever. great ribbon tree card, love th echoice of ribbon. the box is so gorgeous with the rich green ribbon bow. thanks for sharing. Very cool ribbon tree card! nice box - love the colors!